With the monumental success and popularity of the London Symphony Orchestras' performance at the Olympics opening ceremony, Molly Flatt tells us how the orchestra got hip. Who would have thought it? Who would have suspected that, amongst all the industrial hobbits, pogoing punks and (sometimes barely) resuscitated musical icons offered by our beautifully bonkers Olympic ceremonies, the London Symphony Orchestra would turn out to be one of the bona fide stars? From Rowan Atkinson’s unforgettable Chariots of Fire hijack to the inclusion of 80 super-talented young East London musicians from 7 to 17, the LSO suddenly looked like the coolest crew in town. With the mantra ‘encourage younger audiences’ surely inscribed on the marketing strategy of every orchestra in the world, ensembles big and small, must be hoping to capitalize on this surge of visibility and pride. Here are five tactics that London’s orchestras are employing to get open-minded twenty- and thirty-somethings to become a more regular part of their repertoire. With the National Portrait Gallery’s weekly Late Shift, the V&A’s monthly Friday Lates and the bi-monthly Late At Tate Britain, we’re familiar with museums and galleries offering late night treats, but fewer of us realise that orchestras are rocking the after-hours culture-club vibe too. The Orchestra of the Age of Enlightenment is an old pro of this approach. Since 2006, its Night Shift has offered “late-night, laid-back and contemporary” sessions designed to pull in a younger post-work crowd, with DJ sets bookending a central hour-long classical concert. Next up? A concert of Haydn’s ‘best bits’ at the Old Queen’s Head pub in Islington on 25th September, which aims to prove that Franz Joseph is as exciting as Franz Ferdinand. In the meantime, check out their podcast. And this summer the Proms is getting in on the act, offering eleven 10pm performances from a selection of young and global orchestras including the West–Eastern Divan Orchestra and the National Youth Jazz Orchestra. If you get the late-night culture munchies of a Saturday evening, their ‘Prom Plus Late’ sessions offer “informal post-Prom music and poetry from emerging young talent” followed by a late bar. The Night Shift isn’t the only trick in OAE’s Gen Y box. Sitting through three hours’ of complex masterwork can be a daunting prospect to an orchestral virgin, so The Works aims to provide an accessible and entertaining way into the greats. In an 80-minute “classical music equivalent of a museum audio-guide”, the audience is taken through a classic work step-by-step, followed by a Q&A and a full performance of the piece. There is music in the bar before and after, and a chance to ‘speed-date the orchestra’ so you can ask the flautists what they really get up to in band camp. Their Flickr sets and Vimeo trailers give a taste of what to expect. Other ensembles are eschewing the big European stalwarts for quirkier works. On September 19th the City of London Sinfonia is relaunching CloSer, its series of informal 75 minute performances during which musicians and audience ditch the formal concert seating and mingle around the bar. The first event has an American theme, with crowd-pleasers from Stravinsky and Copland mixed with an unusual guitar, bandoneón and strings concerto from Argentine tango composer Astor Piazzolla. Not bad for £15 (including a drink), and you can preview the concert playlist on Spotify. To cater for digital natives, podcasts, videos and photo sets are becoming ubiquitous. The London Philharmonic Orchestra was the first in the UK to create an iPhone and iPod Touch app, now also available for Android devices, which allows users to download podcasts and videos but also check concert dates, buy tickets and listen to complete movements from the upcoming programme. Live streaming is also increasingly commonplace. The Royal Philharmonic Orchestra hosted the first ever online streaming of live concerts directly from Cadogan Hall, and you can download their current resident series via Cadogan TV at £4-5 a pop. Last December, the North London-based Aurora Orchestra teamed up with DERO live, an orchestral digital streaming project which is part of the Digital R&D Fund for Arts and Culture, to stream a live performance of Mozart's Requiem online and in selected cinemas, garnering almost 15,000 viewers who watched on average 98% of the show. In March they live streamed Nicholas Collon’s Love Song to the City from the Roundhouse, and platform hosts Videojuicer are planning more, so join their mailing list to catch the next event. But for some truly immersive interactivity, head to Universe of Sound, a collaboration between the Science Museum and the Philharmonia Orchestra. In a free installation at the museum, a virtual Philharmonia performs Holst’s The Planets while visitors usegiant visual displays, touch screens, unconventional projecting surfaces, movement-based interaction and planetarium-style projections to take part as musicians, conductors, arrangers and composers. Catch it in situ before the end of August or get a taste online at The Space. Simply listening to music can be challenging for a multimedia generation, so orchestras are dabbling in artistic crossovers to engage several senses. One example guaranteed to please is BBC Worldwide’s upcoming Planet Earth In Concert at Royal Festival Hall. Showing reworked HD imagery from the groundbreaking Attenborough series, along with a live performance from the Philharmonia of Emmy award-winning British composer George Fenton’s stirring score, Olympic-level tingliness is inevitable. Founded in 2009 with a specific mission to make orchestral music more accessible to a wider audience, the London Arts Orchestra frequently blurs the boundaries between theatre and music. Their October show called Time for Tales, taking place in London’s trendster heartland at Christ Church Spitalfields, promises a magical journey through “the music and stories of Sleeping Beauty, West Side Story, and War Horse”. Supported by the National Theatre and multidisciplinary Pimlico group People at Play, it should help shift assumptions of what orchestras do. Finally, no new audience strategy would be complete without the T-word. 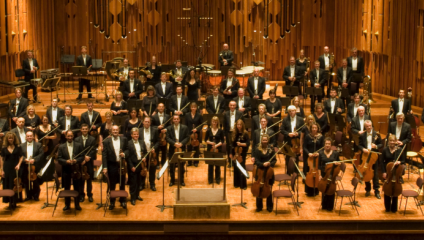 Orchestral Twitter profiles are rife, and the LSO has a good Twitter list featuring 284 global orchestras. Its own profile is an impressive example with almost 58,000 followers, exclusive freebies and discounts, and a generally switched-on, friendly and responsive feed featuring debates, retweets and hat tips to other top acts. It also promotes their Google Plus Hangouts: discussions with conductors, composers, musicians and writers which the public can watch live on YouTube while asking questions and adding comments. When it comes to Facebook, the English National Opera page is worth a look. With over 9,000 Likes, it posts news and links to multimedia content, rewards loyal fans with prizes such as posters, announces competitions, conducts polls and gives a peek into the lives and passions of the ENO team. In fact, orchestras’ social presences are generally of a higher quality than most arts organisations’, reflecting their current priorities. If you want to convince a younger audience to try something new, word of mouth is far more effective than slick marketing campaigns. From all the evidence above, it looks like orchestras could just be on the cusp of a popular groundswell.